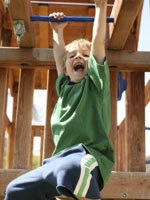 ~ The physical area of development is addressed when the children are running, jumping, kicking and throwing. They are developing their physical self. This area includes such skills as: large motor, small motor and hand-eye coordination. Large motor skills are promoted through activities that integrate running, jumping, kicking, balancing, crawling and so on. Small motor skills are addressed through cutting, pasting, coloring, painting, etc. Hand-eye coordination is aided through writing, cutting, lacing and coloring. ~ Emotional development refers to the development of a sense of self. It answers the question, "Who am I?" Some of the areas included in emotional development are: positive self-concept, self-control, feelings and emotions. The children are actively involved in activities that have been specifically designed to meet their age and ability levels. They will learn about themselves and those around them. ~ The social area of development is perhaps one of the most important in a young child's life. This area includes skills such as: getting along with others, cooperation, sharing, how to be a good listener, good manners, and following directions. One of the major ways we do this is through group activities; especially games. Games teach rules, cooperation and sharing. They also encourage the children to be good listeners. They learn first-hand about social skills by incorporating role-play activities and group enhancement activities. ~ We believe that intellectual development is merely one part of a child's overall developmental experience. Our programs help encourage this through hands-on activities. They are the best way to teach children concepts such as numbers, colors, letters, getting along with others and character building qualities. Through investigation and experimentation, children are exposed to emotional, social, physical and cognitive concepts necessary in achieving a "whole child" approach. Some of the areas include: problem solving, memory skills and questioning. * We are proud to offer Mother Goose Time Pre-School Curriculum. Mother Goose Time curriculum fulfills the Head Start Domain Elements, Standards and Indicator guidelines, and is consistent with the National Association for the Education of Young Children guidelines for curriculum content.